The C-150-E is a cold applied low profile power connection. 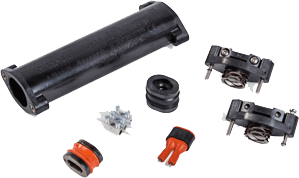 The kit enables in line connection of Raychem industrial heating cables, BTV, QTVR, XTV and KTV, to a flexible power cable. It can be used in applications with temperature ratings from -50°C to 215°C. It is approved for use in hazardous areas. 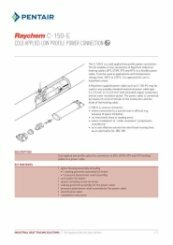 A Raychem power cable may be used or any suitable standard industrial power cable type 3 x 1.5 mm2 or 3 x 2.5 mm2 with stranded copper conductors and an outer insulation jacket. The power cable is connected by means of screw terminals to the conductors and the braid of the heating cable. As a cost effective solution for short heat-tracing lines as an alternative for JBS-100.